lower left in graphite: "The Stack Yard. "; lower right in graphite: Eric Slater. Fowler, Alfred. Catalogue Raisonné of The Woodcut Society. Kansas City, MO: The Woodcut Society, 1942, no. 14. 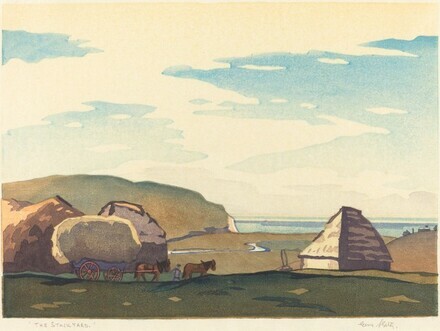 Czestochowski, Joseph S. James Swann: In Quest of a Printmaker, with Presentation Prints of the Chicago Society of Etchers, Prairie Print Makers, and the Woodcut Society. Iowa: Cedar Rapids Museum of Art, 1990, appendix C, p. 144, no. 14.